Beware of longer lists on the internet! Just because it's on the internet doesn't mean it's true, and many websites list foods that aren't nightshades at all, such as blueberries, cauliflower, artichokes, okra, apples, etc. 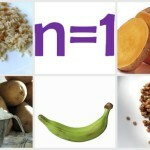 The problem is adding foods to lists based on internet rumor rather than scientific validation. Thankfully, Sarah Ballantyne did some exhaustive research in this area and busted these rumors as myths. So, don't make your life harder by avoiding more foods than necessary. If you ever wonder if a food is a nightshade, simply look up its scientific family. Only members of the Solanaceae family are nightshades. First of all, nightshades aren't harmful to everyone, but they are often harmful to people with autoimmune disease. These vegetables all look so different, it's surprising to discover they're all part of the same Solanaceae family. They all contain toxic compounds called alkaloids. In nature, these protect the plants against insects, by poisoning the insect and dissolving its cell membranes. Unfortunately, alkaloids can have a similar effect in humans, increasing our inflammation, overactivating our immune system, and causing permeability in our intestinal membranes (known as leaky gut), all of which contribute to autoimmune disease. If someone's healthy, with low inflammation in their body, a balanced immune system, and a healthy and strong digestive tract, they can often eat nightshade vegetables without a problem. However, people with autoimmune disease are vulnerable, and nightshades often exacerbate symptoms. What are Symptoms of Nightshade Sensitivity? How Do I Learn If I'm Sensitive? The only way to know is to eliminate them from your diet for at least 30 days. (No cheating.) Then, reintroduce them into your diet as a test: eat them at least 3 times over a 2-day period, and then stop eating them, and monitor your symptoms for 72 hours. Did you improve during the 30 days? Did you have a negative reaction when you ate them again? If yes, you're nightshade-sensitive. If no, you're not. 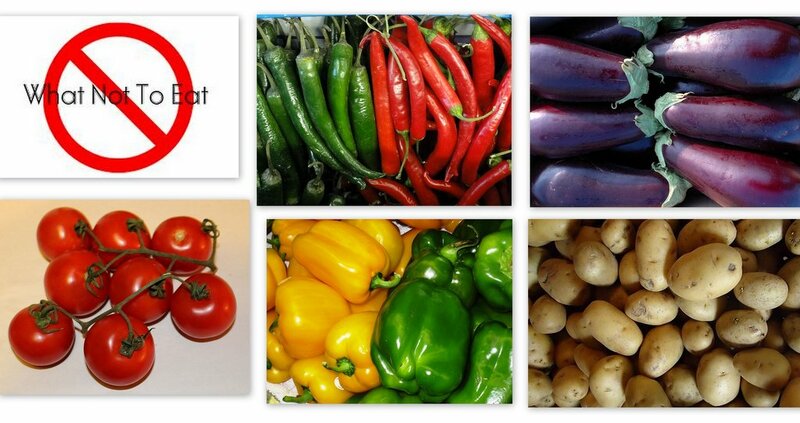 You'll find articles on the internet saying there are no peer-reviewed studies to support the nightshade-inflammation connection. This is true, largely because there's no profit to be made in that research and therefore no funding. But you'll also find many people who eliminated them from their diet, reintroduced them, and saw a clear connection between eating them and their symptoms. 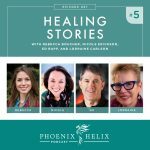 I'm one of those people, as is Sarah from Paleo Mom, Mickey from Autoimmune Wellness, Whitney from Nutrisclerosis, Stacy from Paleo Parents, and many others. Does the Amount Matter? Can I Eat Just a Little? I don't recommend it. When I first went nightshade-free, I gave up the vegetables but kept eating the spices. I thought, ‘How can such a small amount hurt me?' My inflammation lessened, but some remained. Then I did a strict elimination protocol, avoiding the spices as well. When I reintroduced them 30 days later, I had a huge reaction. Every joint in my body hurt, and it took 2 weeks before I returned to feeling normal again. Elimination diets are powerful learning tools, because by removing a food from your circulation altogether, you eliminate the chronic inflammatory response. When the food is reintroduced, if you're sensitive, you will get an acute short-term reaction. It's a very clear communication from your body on what foods are good for you and what foods are not. Can You Be Sensitive to One and Not the Others? It's possible, because each vegetable has a slightly different alkaloid. You can test yourself by reintroducing them one at a time. How Can I Live Without Them? Let's not lie; it ain't easy. I cried when I learned I had this sensitivity. These are some of the most delicious vegetables and spices. They're also heavily used in restaurant and store-bought food, making shopping and eating out even more difficult. However, there is a clear reward to a nightshade-free life: you feel better. If you're craving potatoes, replace them with a starchy alternative: sweet potatoes, beets, parsnips, butternut squash. You can cook all of these the same way you cook potatoes: fries, chips, roasted, mashed, and you know what? They have more flavor, too! Although there's really no substitute for a fresh summer tomato, there are nightshade-free substitutes for marinara sauce, ketchup and BBQ sauce. Nightshade spices usually give food a hot kick. You can still get this sensation through non-nightshade spices like ginger, garlic, horseradish and wasabi. Usually you'll need more of these spices than you would of the red peppers. Experiment. Restaurants are tricky. 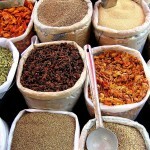 Many sauces and spice blends contain nightshade spices. You have two options: ask your waiter how the food is seasoned (and trust them to tell you the truth). Or order your food unseasoned and bring some spices with you. Herbamare is a good choice (lots of flavor, no nightshades). If you want to buy lunch meat, unfortunately most of them have nightshade spices. Paprika is especially overused because it adds color. However, Whole Foods has a “naked” line of deli meats and rotisserie chickens, which means they are simply meat with nothing (including spice) added. US Wellness Meats offers some nightshade-free snack meat options that you can order online (check ingredient lists). Epic Bar now sells a wide variety of nightshade-free meat bars. And Wild Zora sells 2 nightshade-free meat & veggie bars: Lamb with Spinach and Rosemary and Pork with Apple and Kale. 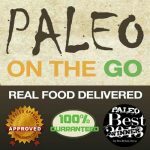 If you're looking for nightshade-free recipes, I host a weekly Paleo AIP Recipe Roundtable on my blog, and every recipe shared is nightshade-free. There are over 3000 recipes in the Roundtable Archives, and if you subscribe to my blog, you'll be notified whenever a new Recipe Roundtable goes live. Also, don't be afraid to modify recipes you already have. You can often remove an ingredient or two without altering the deliciousness of the dish. Get creative and see what substitutions work best for you. Here's my favorite nightshade-free curry recipe, and ShopAIP also sells a store-bought nightshade-free curry blend. 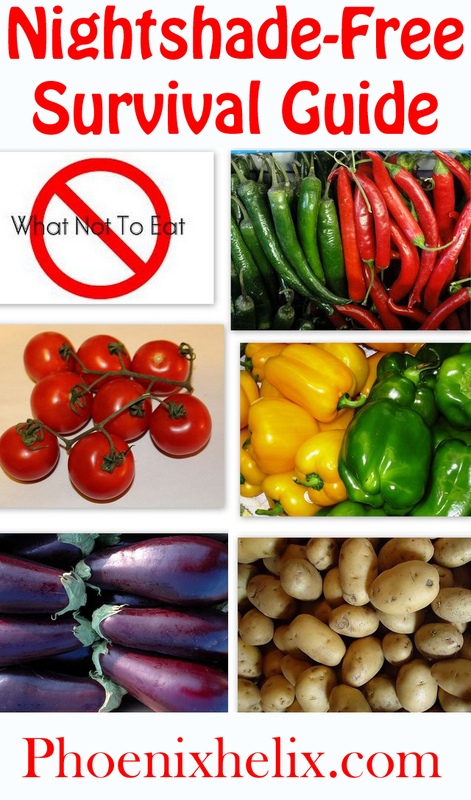 Lastly, be aware that nightshades can sometimes show up in medications and supplements. Always read the labels and verify the source of ingredients. When there is no label, ask your doctor or pharmacist. Photo credits: Images in the featured collage came from Wikimedia (creative commons).